In the first book of the Southlea Bay series, a writer’s group that celebrates their failures is thrown into turmoil when their leader receives an acceptance letter. The quirky cast of characters takes a road trip to recover the manuscript from the publisher. Along the way, a mystery surrounding the manuscript is revealed. The stakes are raised, and the misadventures escalate. Kelman does a fine job assembling an eclectic cast of characters. But more than that, Kelman subtly articulates the fear of rejection and the fear of being judged, two fears that are very real to many artists. Kelman also claims she can sing the first verse of “Puff, the Magic Dragon” backward; that alone should make you want to check out her books. 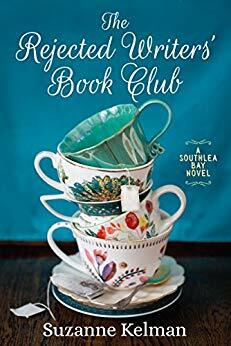 The Rejected Writers’ Book Club is full of intriguing characters and places, a portion of whimsy, some mystery, and a hint of romance. After reading the first book, there are two others waiting to be devoured. Follow Suzanne on twitter, check out her website and podcasts, and buy her books on Amazon.